We will call you in a few minutes. The Lunar II Series of Gold Coins is one of the Perth Mint's most successful to date as well as one of its most beautiful. Intricate designs, exceptional purity and outstanding quality and workmanship ensure that these limited-edition gold coins are always in demand. 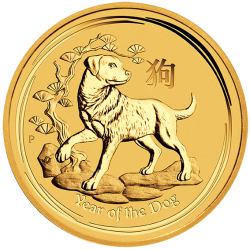 The Lunar II Gold Coin Series began with the Year of the Rat (2008) and will end in 2019 with the Year of the Pig. Although this collection based on the twelve animals from the Chinese Zodiac is incredibly popular, a choice of sizes makes it an affordable option for every buyer. Each Lunar II Series coin is struck from .9999 gold and sizes include 1/2oz, 1/4oz, 1/10oz and 1/20oz as well as the perennially popular 1oz coins and special edition 2oz coins. Lunar II coins are legal tender backed by the Government of Australia. The Lunar Series II gold is struck to the highest standards and is available in a range of sizes and denominations. Each year they feature a new design to indicate one of the 12 animals in the Chinese astrological calendar thus not only represent a wise investment, but also make thoughtful gifts that will be cherished. CoinInvest has a great selection of Lunar series gold coins for your to choose from. With a variety of sizes, years and designs the choice is difficult, but we guarantee excellent prices on all our bullion products. To purchase gold and silver coins from our online store, simply click on the coin of your choice from the collection above and add to your basket by clicking on the orange strip under volume pricing section in the product page. Please note that the denomination on the coins is displayed in Australian dollars (AUD) and does not represent the actual value of the coin. The cost is worked out based on the current spot prices which is influenced by supply and demand on the world stock market. Of all the coins produced by the formidable Perth Mint refinery, the Lunar Series II rank amongst the finest for their uniqueness, quality and liquidity. Made from .9999 pure gold or .999 pure silver, the collectible coins are issued as legal tender under the Australian Currency Act 1965 and are backed by the Australian government. The Lunar Series II are designed to celebrate the ancient Chinese Lunar Calendar starting with the Year of the Rat in 2008. This was followed in 2009 with the Ox, the Tiger in 2010, the Rabbit in 2011, the Dragon in 2012, the Serpent in 2013 and the Horse in 2014. Other issues scheduled to follow are the Goat (2015),the Monkey (2016),the Rooster (2017),the Dog (2018) and the Pig in 2019. The Lunar Series II produced by the Perth Mint are not to be mistaken by the Lunar Series that have been produced in China since 1981. The Australian coins were first introduced by the Perth Mint in 1996 and have become some of the most collectible bullion coins in circulation today. Both Lunar Series are steeped in tradition and symbolism, representing over 2600 years of history. The ancient Chinese believed each animal in their astrological calendar has a profound influence on the personality of those born under its rule. Although modern day China uses the Gregorian calendar for civil purposes, the lunar calendar is used for festivities starting in January when the country celebrates its New Year upon appearance of the new Moon. The Lunar Horse coin appeals to investors and collectors because of their rarity due to the limited numbers issued each year. Not only that, but the annually changing designs make the coins unique and undeniably beautiful. The Lunar Series II gold and silver coins are issued in various sizes, namely, one ounce, 1/2oz. 1/4oz. 1/10oz. and 1/20 oz. The whimsical designs of the Lunar Series are what gives the collection their appeal. The obverse side of the coins show the traditional effigy of Queen Elizabeth II of Great Britain designed by Ian Rank-Broadley together with the nominal value of the coins and the country of origin, Australia. The year and the purity is also found on the obverse side, namely .9999 on the gold coins and .999 on the silver. The reverse side features the animal assigned to that particular year in association with the ancient Chinese Lunar calendar. Based on astrological believes, there are 12 animals representing each house of the zodiac. The Perth Mint also leave their usual mint mark “P” discreetly embedded in the design to help protect cons from being counterfeited. The advanced minting procedures employed by the Perth Mint Refinery enable them to compete on a regional, national and global level. Although they are a private mint and produce a wide range of coins, the Lunar Series II is backed by the Australian government and is thus issued as legal tender. The manufacture and design of the Lunar Series II gold coins anticipate design and market trends. Few mints can compete with their wealth of tradition and experience, particularly when it comes to the wide diversity of coins the Mint offers on an annual basis. The meticulous minting process starts with the artistic design which can take up to a year to perfect, before it is moulded into a 3-D model. The die is then added using state-of-the-art minting and finishing techniques and checked by hand to ensure a high standard of quality is maintained. The coins are then packaged in a protective wrapping and despatched to the Australian Central Bank. The Perth Mint has an excellent reputation of minting standards on behalf of the Australian Central Bank and private international clients from all over the world including London, New York and Dubai. All the coins issued by the Perth Mint are given quality assurance with impeachable security measures to protect investors from the risk of receiving fraudulent coins. The coins manufactured to the highest standards and packaged in protective wrapping. CoinInvest is always interested to hear from anyone with Lunar gold coins for sale. We offer very competitive market rates so if you have any Lunar coins issued by the Perth Mint do not hesitate to contact a member of our friendly customer services team who will prepare calculate a price based on the latest spot price and confirm the offer by email. © 2019, CoinInvest.com. All rights reserved.